If you can’t seem to drop the pounds despite watching what you eat, it might be something else that’s holding you back. You may have banished bread, ditched the wine, and stopped snacking between meals, but no matter what you try the pounds just won’t shift. According to the experts, your lifestyle could be the problem. But don’t worry, making some small tweaks to your daily routine could work wonders for your weight loss. Here’s 10 simple changes to your day-to-day routine that could help you lose weight much more easily. According to the Journal of the American Dietetic Association, people who eat slowly have on average a BMI 11% lower than those who eat quickly. It takes some time for receptors in our stomach to signal to our brain that we’re full. Eating slowly facilitates this process and makes us eat less as a result. Your body is tricked into getting ready to absorb nutrients, and when it only receives chemicals from a diet drink, the brain signals that we need to eat something to make up for the lack of vitamins and minerals. Making you crave food. Diet drinks provide a sweet flavour but no real sugar, which may sound like a good thing, but this actually triggers the body into craving real sugar. Your blood sugar levels become unstable and brings on food and sugar cravings. Sleep deprivation affects the hormones that regulate your apptite, and increases your desire for high-calorie foods. Studies show that sleeping for less than five hours a night increases the likelihood of weight gain. So avoid reaching for the wrong foods by making sure you get plenty of shut-eye. Walking is always a good thing and will help you to lose weight a little faster. Start small and walk to the end of the road and back. Even walking to the bus stop is enough to get your heart rate up. Walking for an hour a day can burn up to 250 calories! Putting the needs of others before your own increases your risk of overeating. You might accept food when you don’t actually want or need it because you feel pressured to do so. It’s important to get the balance right and to feel comfortable to refuse politely if you don’t wish to eat something. If your mind is preoccupied, you’re more likely to eat without realising it. Even the adverts can remind you of food and trick you into thinking you’re hungry. Define places and times for eating meals, and then train yourself into not engaging with foods outside those set places. Take a look at the quality of the food that you eat in front of the TV. If you really must snack while watching, choose cherry tomatoes and cucumber, not chocolate. Have you ever thought to yourself, “This is the last time I’m going to have a takeaway and then I’ll stop”? This thought process is known as permissive thought. We all have them. You just need to be aware of them and try not to accept them. Ask yourself how much better you’d feel if you didn’t eat it. Try keeping a detailed record of everything, before you consume it. If you have to acknowledge that you’ve had a biscuit by writing it in a diary, it may just be enough time for you to reconsider. It’s important to learn from your setbacks rather than beating yourself up and feeling down. Don’t give up, and try putting it in perspective. Think of ways to get back on track and have a better day tomorrow. If you have a lot of weight to lose it can seem overwhelming. 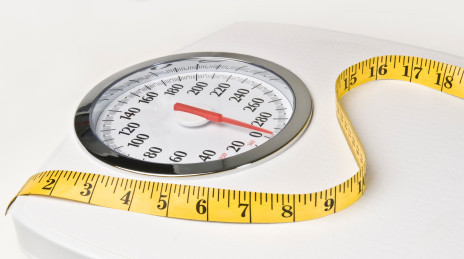 Change your cognitive process to acknowledge that losing even just one pound is a good thing. Go to your fridge and take out two packs of butter, which add up to 1lb. You’ll find that it’s actually quite a lot of weight. Stay motivated by thinking about why you want to lose weight in the first place. Keep a list of questions on the inside of your fridge, such as: “How would you like to look?” and refer to them when you’re feeling disillusioned. Rather than looking at long-term goals, think about what you want to achieve by next week. Give yourself short-term goals with non-food related rewards. If you lose a certain amount, go to the cinema or have a massage. When trying to lose weight, you can become preoccupied with thinking about food. Having hobbies to distract from those thoughts is key to psychological wellbeing. And the busier you are, the less time you have to think about food! It can be anything you enjoy doing, as long as it keeps you busy. You could kill two birds with one stone by taking up a sport, joining an exercise class, or going to the gym – keeping active is one of the key elements to weight loss and weight maintenance. Try a hobby with other people for added social support, such as a team sport, book club, or walking group.